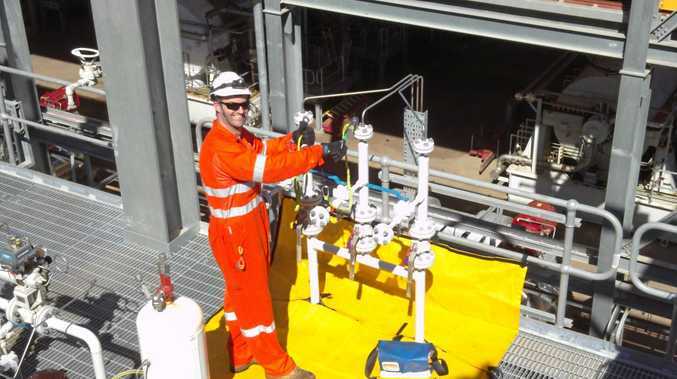 QGC's Ross Davison uses his innovative solution of a new dropped object prevention blanket to help prevent injuries and save lives. COMPANIES across the state are thanking a Curtis Island worker for his light bulb moment that's improving safety on construction sites. QGC mechanical technician Ross Davison has come up with an innovative solution to prevent injuries from dropped objects. Mr Davison worked with a Gladstone company to introduce a new piece of equipment, an object prevention blanket. Mackay business Coalport Bags developed the design concepts after testing four of them. As a result, QGC is now sourcing 30 more sets to issue to all work groups across mechanical, electrical and operations on Curtis Island. The kits can be adjusted in size with additional blankets if required and have been designed to ensure there are no trip hazards. They are produced using a fire retardant material which is bright yellow to ensure it is noticeable from below where work is occurring above. QGC's upstream team is already looking to place an order for work groups in the Surat Basin.